Cemeteries aren’t typically the first thing that comes to mind when thinking about endangered historic places, but more and more people are recognizing the importance of these spaces as keys to understanding community history. 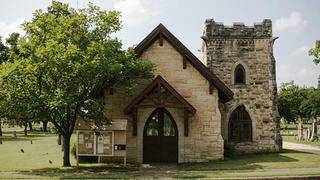 The rapidly growing city of Austin, Texas, has seen its share of preservation struggles, including over the care of its historic Oakwood Cemetery, established in 1839 as the city's first cemetery and later listed on the National Register. After years of advocacy work done by Save Austin’s Cemeteries, a nonprofit group assembled by local citizens concerned with the preservation of the city’s five major cemeteries, Austin’s Parks and Recreation Department (PARD), who cares for the cemeteries, created a comprehensive master plan to document the condition of the five cemeteries and recommend best practices for maintenance and improvements. The chapel prior to renovation. 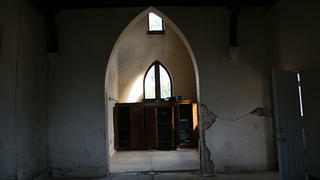 A shot of the interior of the stone tower before renovation. 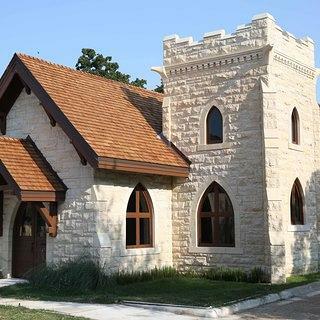 One project Save Austin’s Cemeteries (SAC) had long been concerned about made it into the Master Plan: Rehabilitating a Gothic Revival-style mortuary chapel on the grounds of Oakwood Cemetery. SAC took the initial steps to advocate for PARD to restore the building, which was suffering from deferred maintenance issues and an unevenly settled foundation, by sponsoring an architectural conditions assessments, a cost estimate, a structural analysis and a geotechnical report on soil conditions. 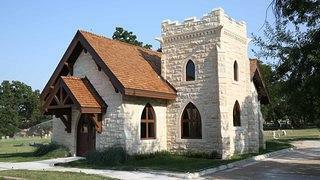 The small chapel—just over 1,000 square feet—was built in 1914, around seventy years after the surrounding Oakwood Cemetery was established in 1839. It was used as a mortuary chapel where bodies were kept prior to burial and where memorial services were sometimes held. The chapel was built in the section of the cemetery historically designated as "the strangers' ground" and a place where ethnic minorities were laid to rest. In 1944, the city of Austin’s Parks and Recreation Department, who cares for the city’s cemeteries, took over care of the chapel, renovating it and converting it to office space. Deferred maintenance issues led the building to deteriorate so when PARD surveyed the cemetery’s condition, the chapel quickly rose to the top of the list as an obvious first project. Funding for cemetery improvement work from a bond passed by the city in 2012 allowed work to start on a design in late 2014 and construction to begin in October 2016. Archaeologists working on uncovering all of the burials discovered in the footprint of the chapel. 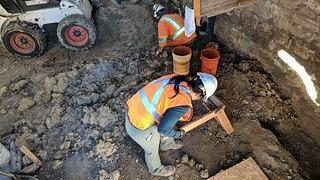 Contractors had to cease work on the building because the scope of the archaeological work was so great. The project faced a significant impasse in 2017, while crews were scoping out the work that needed to be done to stabilize the building’s foundation. 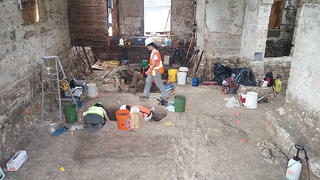 Burials were uncovered underneath the building, leading the PARD to put a hold on construction while archaeologists came in to excavate what ended up being the remains from 38 burials. The excavation process ended up taking 8 months, but the archaeological work led to the acquisition of additional funding from a hotel occupancy tax program that supports historic preservation projects with potential to encourage tourism within Austin. PARD turned to the community for thoughts on how to most respectfully address the unexpected discovery, and the remains were sent to the Forensic Archaeology Center at Texas State University to be examined to learn more about the individuals uncovered. An initial review of the most intact burials revealed that they appeared to be a diverse mix of ethnicities, though a more in-depth investigation is still ongoing. Parks staff are working on a plan for how to best commemorate and respectfully reinter the remains, a difficult process with few precedents to model decisions after. "There's a handful of cases we can look at and say, that's a good practice," PARD staff member Sarah Marshall explains, "but I don't necessarily think there's enough that best practices [have been] established." 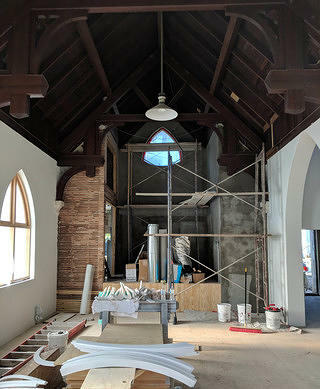 A mid-construction shot of the renovation work on the chapel's loft area. Work on the building eventually resumed and ended up being a comprehensive $1.26 million renovation. Most significant was stabilizing the building’s foundation, which had sunken unevenly over time due to the consistency of the soil. The building’s perimeter grade beam was reinforced with concrete piers. The deferred maintenance on the chapel meant doors, windows, and the roof had to be replaced and the interior and exterior finishes, such as masonry and plaster, refurbished or restored. An HVAC system was installed (crucial for Texas summers) as was insulation in the roofline. The building also required an overhaul to the lighting, mechanical, and electrical systems. ADA access improvements were also made. A restroom, first installed in the 1944 renovation, was restored, which required an accompanying renovated plumbing scope. In the restroom is a historic vault, once used to store the cemetery records (since moved elsewhere), which was refurbished as part of the renovation. The chapel in the early stages of renovation. The building after renovation finished, featuring a new roof and windows, as well as restored masonry. The front entrance of the chapel after renovation. 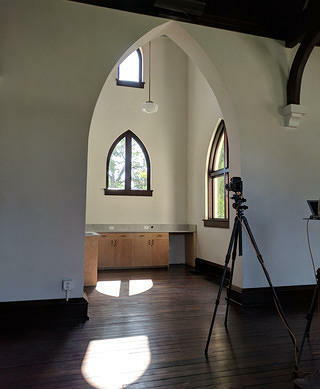 The freshly renovated interior of the chapel's stone tower. The project wrapped up in the summer of 2018, with a ribbon cutting in August. Plans are for the chapel to serve as a visitor center space for Oakwood Cemetery, possibly with exhibits on local history, and to be used to hold memorial services again. “I think [the renovation] gave an opportunity for the city to reflect on its past and preserve a special architectural place for future generations,” PARD Project Manager Kevin Johnson says of the project. 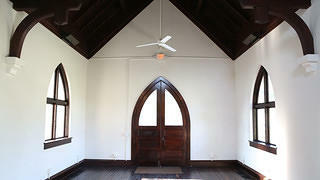 The chapel’s rehabilitation is just the start of the work the Austin PARD hopes to do within its five cemeteries. Currently, work is underway to plan the chapel’s interpretation, including how to honor the individuals whose remains were found within the chapel footprint. More rehabilitation work is underway around the cemetery, including restoring three historic entry gates and replacing perimeter fencing. PARD has also begun a first round of architectural improvements to another cemetery building, which features a similar architectural style. 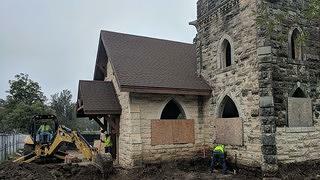 With funding secured to hire a staff person to run operation and manage interpretation of the chapel building, it looks like this renovation will mark the start of a new chapter in the life of Oakwood Cemetery Chapel. PARD staff hope to get the local community more engaged and interested in the local history found in cemeteries like Oakwood. Johnson is equally confident about the importance of the chapel and surrounding cemetery: "There’s so much history that’s packed into these grounds and it’s unknown to so many people. Being able to understand at such a granular level the context that this building played ... in the history of our city was a really special opportunity."